Fans who grew up in the 1980s have been in for quite a treat this summer with the debut of Netflix's hit series Stranger Things, which already has fans clammoring for a second season. The show has been the perfect supplement for fans of another 1980s-set series, the ABC sitcom The Goldbergs, which is currently on its summer hiatus before returning for Season 4 on Wednesday, September 21. It seems that The Goldbergs series creator Adam F. Goldberg is such a big fan that he's trying to get a crossover episode put together between both shows. Adam F. Goldberg revealed on Twitter yesterday that he is "100% game" for a crossover between The Goldbergs and Stranger Things. He even asked for Stranger Things creators The Duffer Brothers to call him at 707-67NERD6 (707-676-3739). The number is actually a working "hotline" set up by The Goldnerds Podcast, where fans can leave their tips, questions and comments to be addressed on the show. As it turns out, someone on the Stranger Things side may be interested as well. Hours after Adam F. Goldberg's initial tweet, Stranger Things executive producer Shawn Levy revealed that, "making this happen just became my #1 goal for this television season." Could this actually work? Adam F. Golberg clarified in responses to his original tweet that this isn't a joke, and he would like to make this happen, but we'll see if a crossover could logistically work. Fans of The Goldbergs know that every season, they pay homage to classic 80s movies with tribute episodes. The first season it was The Goonies, while the second season was Ferris Bueller's Day Off, with the show even bringing Charlie Sheen on to reprise his same role from the original movie. Last season the show honored Dirty Dancing, and it was recently confirmed that the upcoming Season 4 premiere tribute will honor The Breakfast Club. The show has also honored other classics like Star Wars, Say Anything and Back to the Future Part 2, just to name a few. It would be interesting to see if the show could somehow pay homage to Stranger Things without referencing that it is actually a TV show that debuted in 2016. Even with Adam F. Goldberg and Shawn Levy supposedly trying to make this happen, the logistics of a crossover like this could be quite mind-boggling for both ABC and Netflix. Still. The CW and CBS both pulled off a Supergirl and The Flash crossover last season, so perhaps this could work after all. 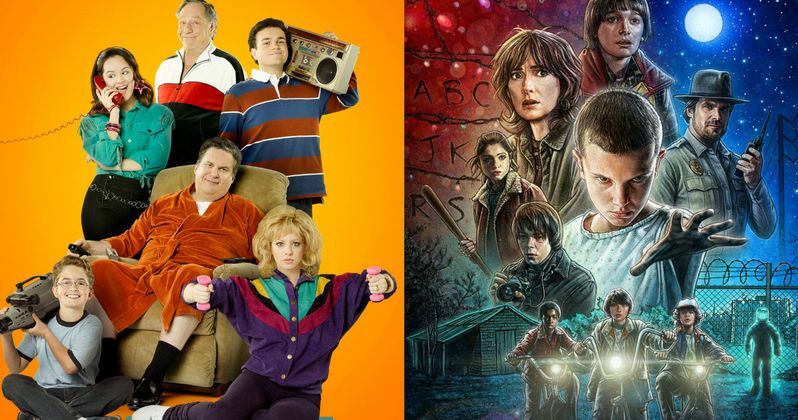 It's worth noting, though, that Stranger Things is set in 1983, and The Goldbergs is set in the mid-1980s, with references to several movies, TV shows and other occurrences throughout the decade. Take a look at these tweets below, and let us know if you'd like to see a Stranger Things/Goldbergs crossover. @adamfgoldberg@TheGoldbergsABC@Stranger_Things making this happen just became my #1 goal for this television season. On it!